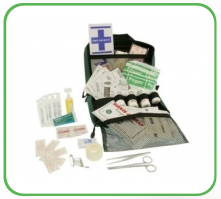 A First Aid Kit is a collection of supplies and equipment for use in giving first aid treatment. 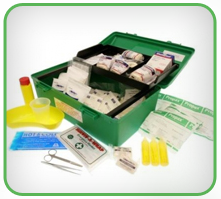 Here at G & A First Aid Supplies, First Aid Kits are made up of different contents depending on what purpose the kit is to be used for. We cater for a wide range of workplace and personal kits. business. We make and distribute First Aid Kits, First Aid & medical supplies, fire safety equipment, emergency eyewash as well as replenishing first aid kits. We provide a complete range of First Aid Kits, affordable First Aid Supplies, products and services for both the workplace and home. Our professional team has widespread experience in the Health Care, First Aid, First Aid Kits and Fire Extinguisher industry in Australia. We can save you both money and time with our convenient and efficient systems. We always make sure you enjoy dealing with G & A First Aid Supplies. All customers have the option to use our user friendly online shopping web site. A number of our customers are “household names”. We supply to large and small companies as well as schools, sports clubs, construction, restaurants, caterers, hotels, shops, road works, in fact all kinds of people. In South East Queensland, Brisbane, Sunshine Coast, Toowoomba and Gold Coast we offer an in-house replenishment service. Our knowledgeable reps will check and refill your kit, or supply new first aid kits. Some prices for this service may vary from our web site prices.